Clinic Comparison, a UK-based company devoted to weight loss and body contouring, has compiled a ranking of the world’s most unhealthy countries using data from the World Health Organization, the CIA World Factbook, and the World Lung Association. Each country’s performance was ranked on three key factors: Alcohol consumption per person, per year, tobacco consumption per person, per year, and obesity prevalence within the population. 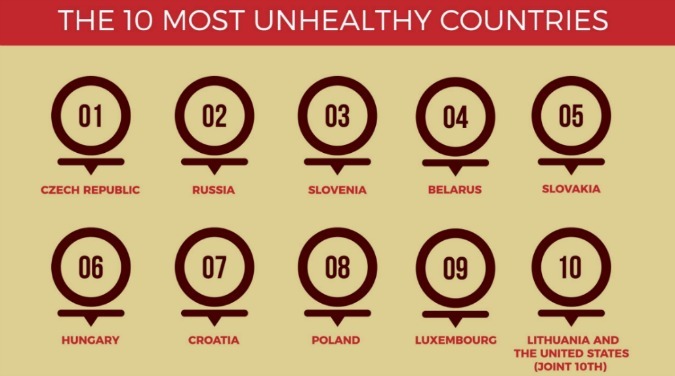 The Czech Republic was determined to be the most unhealthy nation in the world. The nation’s citizens emerged as some of the heaviest drinkers, each consuming a massive 13.7 liters of pure alcohol every year, the equivalent in volume to 550 25ml shots (that’s about 1.5 shots a day). Czechia also ranked 11th highest for the number of cigarettes smoked each year, despite having some of the strictest laws on tobacco purchase and consumption in the EU. 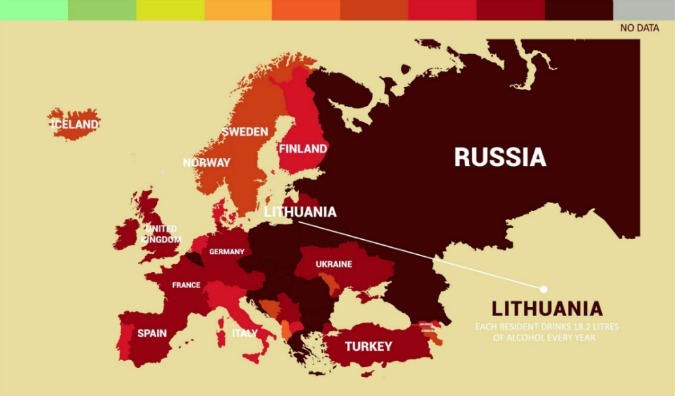 Eastern Europe locked down the top 10 with the exception of the Luxembourg at #9 and the US which tied Lithuania as the tenth most unhealthy country on the planet. While other regions outranked the Czech Republic as the world’s most overweight, notably Samoa where 41.6 percent of the population is obese, Czechs are consistently named among the fattest in Europe. Afghanistan is considered the world’s healthiest country; the African nations also fared well. Noncommunicable diseases such as heart disease, cancer, and diabetes are now the primary cause of premature deaths worldwide, killing over 36 million people each year. A large percentage of these conditions are caused by unhealthy lifestyle choices such as drinking, smoking and an unbalanced diet. Work in the Czech Republic? Use 10 vacation days for a 20-day holiday this spring!